ChannelMfm - Basil comes from India and has been developed since about 5000 years ago. Basil leaves (Ocimum basilicum) frequently used in Italian cuisine and southeast Asia, such as Malaysia, Indonesia, Vietnam, Cambodia, Thailand, Laos, and Taiwan. Plant basil leaves generally have a high 30 to 130 cm and grows in the tropical area that is hot and dry. This plant can be grown indoors, although most appropriate to grow outdoors. Green Leaves that have a distinctive flavor and aroma is composed of several different types. 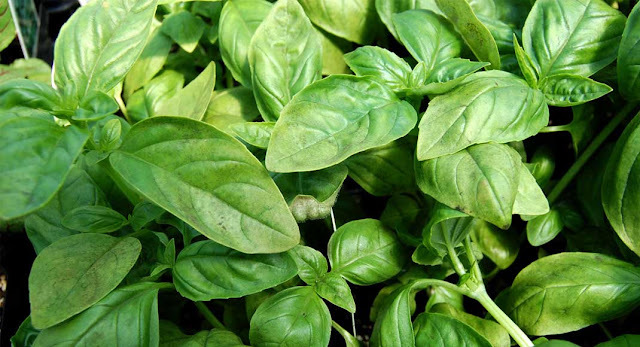 Basil leaves commonly used to in Italian cuisine is sweet basil, different from the basil used in Asia. Types of basil leaves that are different eject the aroma is also different. Depending on the type, the leaves of basil can contain a variety of substances that produce the distinctive aroma depends on the levels of the components of each substance. Such substances include citronellol, linalool, myrcene, ocimene, terpineol, linalyl acetate, fenchyl acetate, trans-ocimene and others. Generally, basil leaves that contain polyphenols such as flavonoids and anthocyanins are not cooked but is served as the raw material fresh. cook, it can lead to changes in taste. - A study found that the content of (E)-beta-caryophyllene (BCP) may be beneficial to handle arthritis and inflammatory bowel disease. - Ethanol Extract of the leaves of the basil kind of Ocimum basilicum contains antioxidants. - Study on the extract of basil leaves kind of O. tenuiflorm shows that this material can reduce swelling up to about 75 percent, 24 hours after administration. - Basil Leaves may have content that is able to prevent the harmful effects of aging caused by free radicals in the brain, heart, and liver. - The Leaves may be a material anti-mosquito and anti-fungal that is used in essential oils. In addition, there are various types of vitamins, such as vitamin A, B1, B2, B3, B5, B6, vitamin C, E, and k Plus minerals such as iron, calcium, magnesium, manganese, phosphorus, potassium, sodium, zinc, as well as less water is 92 grams can also be obtained in the basil leaves. The therefore ingredient that is rich in nutrients, the leaves of the basil is already the ordinary into the extra options on the presentation of a healthy and practical in Asia.